Another in the series of wacky titles National tried in the 1960s was the amusing kid book, Angel and the Ape which first appeared in the anthology title Showcase #77 in September of 1968. Created by writer E. Nelson Bridwell and artist Bob Oksner, this fun loving title revolved around two unusual private eyes. Angel O'Day was a investigator who managed the O'Day and Simeon Detective Agency with her ape partner in a suit, Sam Simeon. With Sam not being your usual partner, since he was both a comic book artist and a talking gorilla, you can imaging the wild story lines over its initial short-lived run of seven issues after the first Showcase try-out tale. Oksner's charming "good girl" art approach for the lovely Angel, coupled with some delicious Wally Wood inks made the feature an attractive sell with some very energetic scripts. 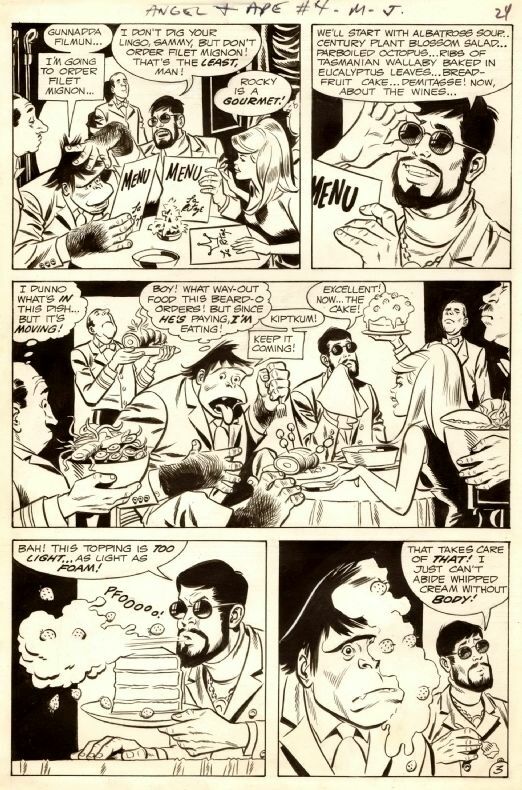 After its cancellation the series was revived two times, once in the 1990s by funny man artist Phil Folio and in 2001 by writers Howard Chaykin, David Tischman and artwork by Philip Bond. Other guest appearances followed over the year in DC titles and brief references making inside jokes to the characters in others, but none ever had the charm of the original series which gave many a fond memory to later baby boomers.